MHA is very pleased to announce that this month, the City of Melbourne has requested the Minister for Planning to apply interim protection for all places cited in the recently completed West Melbourne heritage review. West Melbourne consists mainly of railway yards and the Appleton and Swanson river docks, but also covers the small triangular mixed residential and industrial area between the rail lines, Victoria Street, the Flagstaff Gardens and Latrobe Street. The pace of change in the industrial part of West Melbourne just north of Latrobe Street has been frenetic, even relative to the development pressure we’ve seen in the CBD and Southbank. Since 2004, the suburb’s population has almost doubled, with three quarters of these newcomers housed in residential apartments. Presently, a further 2800 dwellings are either under construction, approved or awaiting planning approval, hence the imperative for the study. The study was amazingly comprehensive, reviewing every building in the study area, including those already covered by Heritage Overlays. The results included new gradings for many places already protected, but the most important finding was that 16 new palaces, mostly industrial heritage, were worthy of protection. The review identified the famous Apollo Gym, originally built as a warehouse and one of Melbourne’s first ever poured concrete structures as worthy of protection. The gym was among the first established in Australia and pioneered the teaching of women’s self defense classes. Dominick Cleary’s 1897 bootmaking workshop is one rare example of the suburb’s surviving nineteenth century industrial heritage. Older still, Charles Barber’s shop and residence dates to 1867, built from a distinctive and unusual basalt masonry. Of equal note and creating some precedent, the review also provides protection for some 1980s postmodern ‘infill’ housing in Capel Street, built by the then Ministry of Housing. And while we’re talking postmodernism, the building you only ever want to admire from the exterior, 1989’s Godfrey Spowers and Darryl Jackson-designed Melbourne Remand Center joins the neighbour it references, the fabulous red brick Victorian former Sands and MacDougall warehouse in also gaining protection. Festival Hall, built in 1955 after a fire damaged the earlier stadium on the site, was for many decades Melbourne’s only large-scale music and entertainment venue, and it makes up for its lack of immediate aesthetic character by housing many decades of accumulated cultural heritage. “This is a miserable place to go to a concert.” Frank Zappa once proclaimed. Nonetheless Melburnians look set to have that opportunity into the forseeable future, as the building now also gains formal protection. 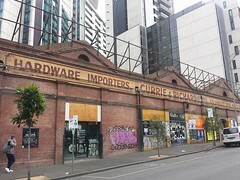 And in arguably the biggest direct heritage windfall from the study, the charming Victorian former Edward J. and Samuel Spink warehouse-workshop at 488 La trobe, which was recently directly subject to proposed demolition under an apartment development should be accorded formal protection. All nominated sites within the study should soon be subject to an interim heritage overlay, preventing demolition or inappropriate development. The panel process that will prefigure permanent protection can take up to year, so interim listing will ensure we don’t lose anything while that occurs. After nearly 9 months wait, in March 2017, the Minister approved Council’s request for Interim protection, but annoyingly excluded two sites subject to redevelopment proposals, and the Postmodern Remand Centre. 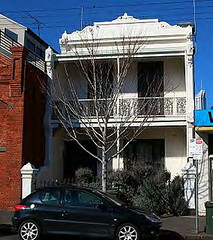 Spink’s warehouse at 488 Latrobe Street, already proposed to be demolished for apartments, was one that was excluded, and so was subsequently allowed to be demolished by VCAT in August 2017. The permanent heritage controls have been added into Amendment C258, which include the new guidelines and gradings for all the City of Melbourne, also exhibited in March 2017. Due to the volume of submissions on this ‘omnibus’ amendment, a Panel had still not been appointed by September.